Need a transformer for your event? Energy Rentals understand that not all transformer requirements are the same so we offer our customers, looking for large scaled implementation, detailed on site survey and system assessments. We can also offer product sourcing and installation covering all aspects of transformer sales and hire. Contact us now and let us help you today. Energy Rentals has massive stock of transformer equipment for hire ranging from multi tapping step up step down transformers with voltage ranges 415v 3 phase to 208v 3phase in sizes from 75kva to 150kva. 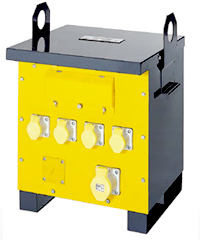 We can also supply grid connection transformers step up 415v to 11000v and step down 11000v to 415v. In our site and construction industry range we can supply 110v single phase and 3phase in ratings from 3 kva to 75 kva for all site and construction applications. Finally, we can supply one to one ratio transformers for test facilities and research projects where critical power systems are essential.